I’m a fan of jumble games, and the online version TextTwist is a genuinely fun one. So I wanted to love TextTwist Turbo, the iPhone and iPod touch version offered by Real Arcade. Unfortunately, too much animation and superfluous eye candy, coupled with user interaction that’s just not well-suited for the game mars the experience. Alert Overload: Gameplay in TextTwist Turbo is interrupted—frequently—with pop-up alerts like this one. TextTwist Turbo takes six or seven seconds to load on my iPhone, which is a bummer. The game offers two gameplay options. Basic Puzzle is the more familiar version: You’re presented with six letters, and you need to find all the three-to-six-character words that can be formed with them. 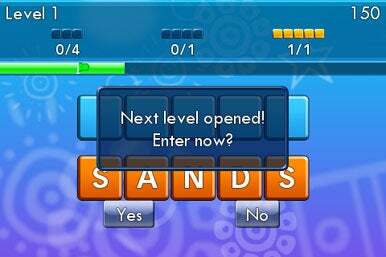 The game also offers Twist Puzzle, where you’re presented with varying numbers of letter tiles, and must tap on adjacent letters to swap their positions. You keep swapping letters around until you’ve formed a word. It’s not fun. Basic puzzle fares better, barely. But the game constantly gets in its own way, making what should be fun into a real chore. Everything in Text Twist Turbo moves—the backgrounds, the buttons, the letters themselves. After you submit a word by tapping each letter, and then press the OK button to submit it, the letters start to zoom back to the board. I’d rather see them reset instantly, instead of being distracted by the annoyingly slow animation. Even worse, the game repeatedly displays pop-up notifications that stop the game, and which you must dismiss manually. The interruption jars every time, and seems designed to maximize the frustration factor. Let me walk you through the awfulness: You’re presented with LMIES. You spot the word “smile” hiding there, and tap it in. Several seconds’ worth of animation zoom by, updating your score. Since you solved a 5-letter word, the game pops up this alert: “Next level opened! Enter now?” You can choose Yes or No. Since you’ve only solved one word, you probably want to keep playing the current level, to score more points. So you tap No. Then a second alert appears: “You can enter the next level from the pause menu.” (Let’s ignore for the moment that there is no Pause menu. In fact, you need to tap the “Menu” menu.) This time, there’s a Continue button—and it’s not placed where the No button was, so you have to move your thumb and tap elsewhere to dismiss this one. You finally get to continue your game, and you tap in “limes.” After a few seconds for the scoring animation to complete, the game throws up yet another alert: “Longest word found!” You respond by throwing your iPhone—hard—against the nearest wall. Or you would, if it didn’t cost so much. Oh, and these same alerts are shown on every single level. Weaknesses abound. For some reason, the game lacks a timer, which is part of the original’s appeal. Once you’re ready to go to the next level, you need three separate taps to get it underway. You can tap the OK button to submit a word, even when you haven’t typed one in. Your list of solved words—a necessary reference—lives two needless taps away. And somehow the developers missed the obvious choice to allow you shake the iPhone to mix up the letters; instead, you tap a “twist” button. There’s room for a good version of TextTwist on the iPhone. TextTwist Turbo isn’t it. TextTwist Turbo is compatible with any iPhone or iPod touch running the iPhone 2.1 software update.